Ultimate Masters is a reprint set, meaning it contains zero brand-new cards. However, that doesn't mean there isn't new art! 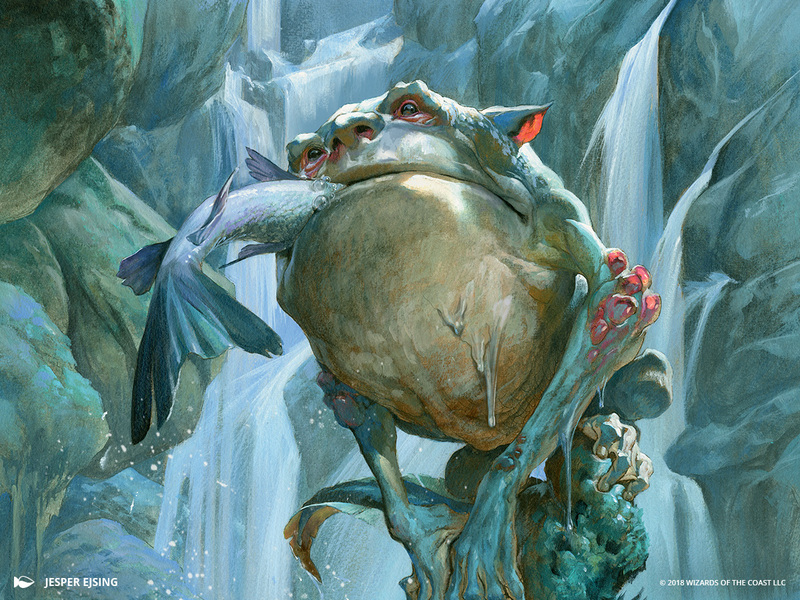 These all-new artworks breathe renewed life into many fan-favorite cards. Let's take a closer look at a few of these in larger-than-card form, along with the art descriptions used to commission each piece! Intent: Lorwyn faeries are devious tricksters who love to play pranks on their victims. This card represents a magical glen where these faeries emerge from their hiding places among the flowers. Action: Imagine entering a beautiful glen in the woods that's alive with blossoms in purples and blues. Now imagine that a wasp-like, dragonfly-winged little faerie has emerged from among the flowers, buzzing by your head with a barbed spear. 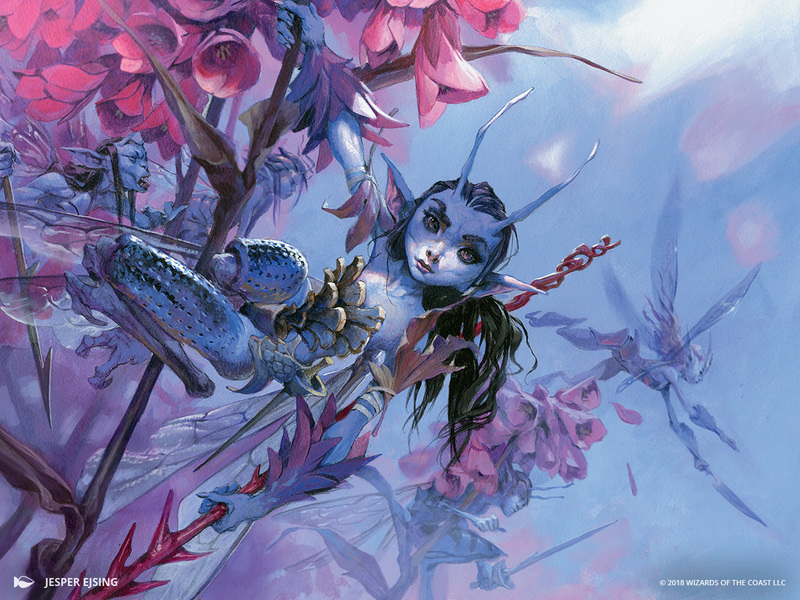 And as you glance again, you notice that the flowers all around you are teeming with these malicious little faeries! Show that scene, with at least one prominent faerie in plain sight and more lurking among the blossoms. Mood: You're in deeper trouble than you first realized. 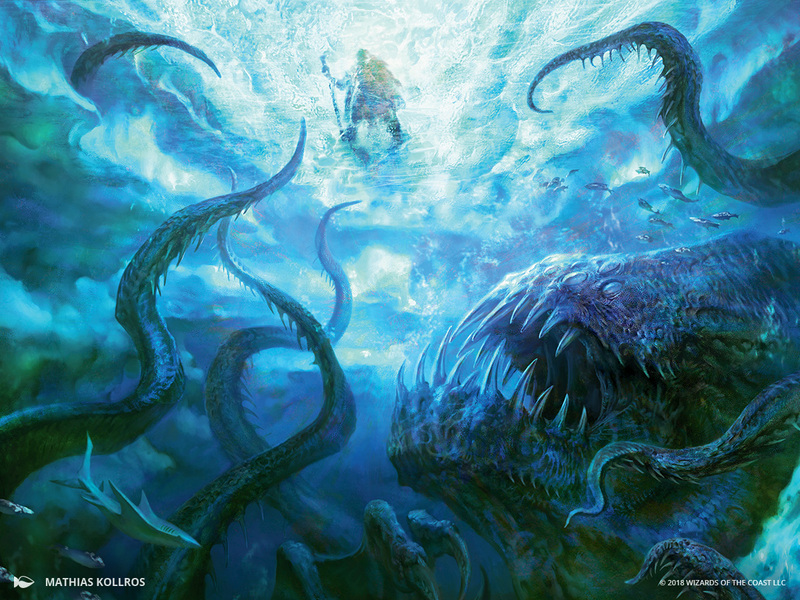 Action: We'd like you to create a scene of the same icy location shown in the reference, but reversed, so that we're underwater with the eldritch entity, looking up through the ice at the tiny figure. Imagine floating near that dark tentacled thing, its unnatural mass rising toward the ice-crust, and the figure walking across the ice above hasn't yet noticed what is just below them. 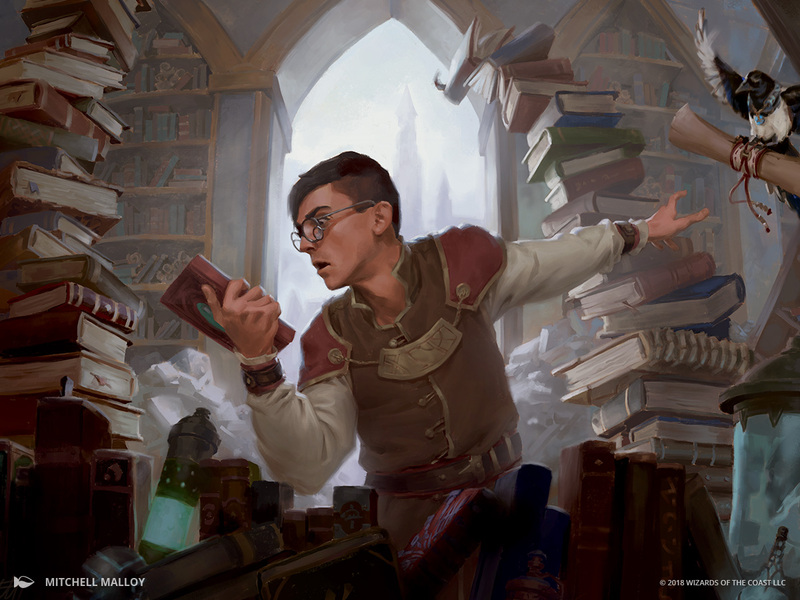 Action: This scene shows a desperate search underway in the workshop of a Tolarian wizard. The wizard is digging through books, papers, and doodads, clearly looking for something important. Perhaps a trained bird watches quizzically or assists. Mood: It's 5 minutes before class and you can't find your term paper. Action: This spell represents nature rapidly reclaiming an urban area. Show brash new plant life that has burst forth from the husks of abandoned undercity buildings. Oversized woody trunks bend out of broken windows. Cascades of bright ferns tumble down staircases. 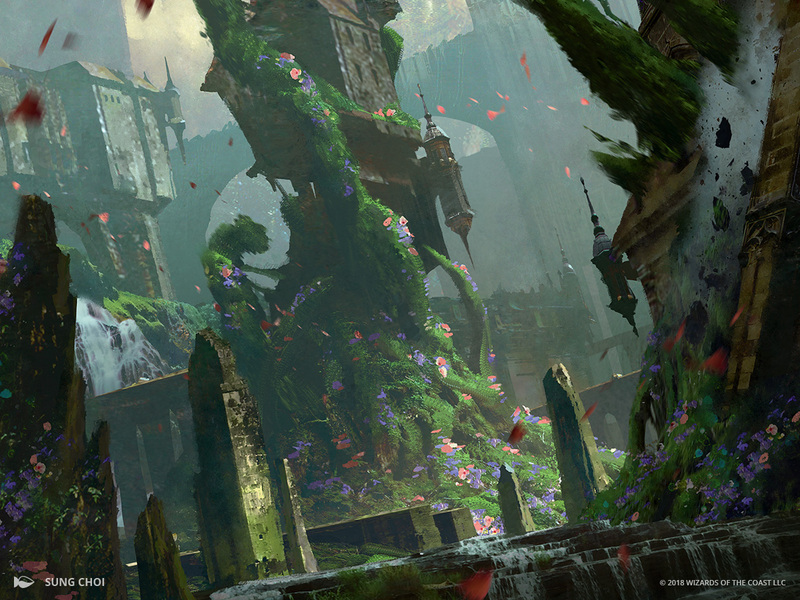 Pillars have been broken by climbing vines and carried up with their reckless growth. Whatever you can think of! Mood: Exhilarating. A dead, forgotten place has transformed into a new living realm. Action: Here's a chance to do a little creature design. This is a small BOGLE, which basically means "weird beastie." It's about half a meter tall and appears SLIPPERY, with slick or slimy skin. It's skittering among gnarled roots, or maybe crossing a small stream. We've sent this card's original art for reference, but you can deviate from it significantly. We're inclined to keep the basic anatomy of a big head with two legs, and those weird, hand-like feet. But even that is up for negotiation if you've got a different weird beastie design—just make sure it isn't humanoid and doesn't look too much like any particular real-world animal or myth creature. 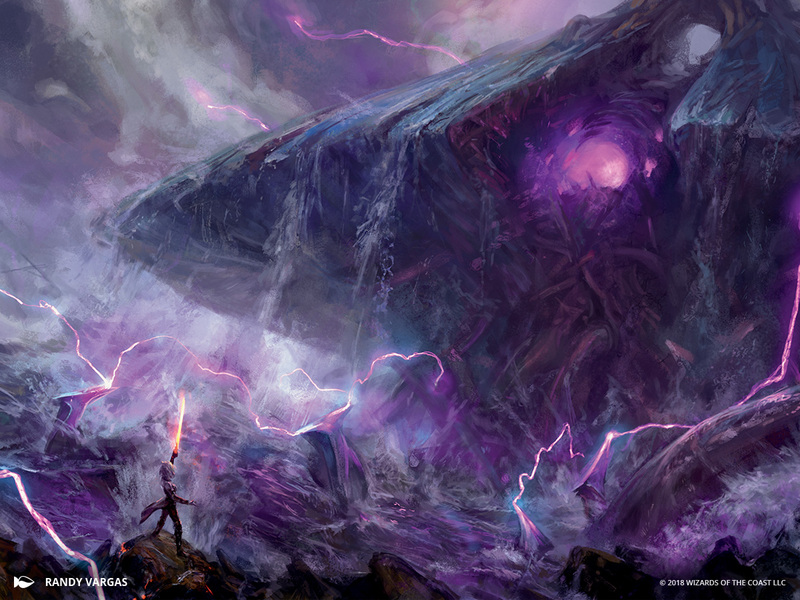 Intent: This piece shows a moment that was illustrated for the Shadows over Innistrad story guide but that we never quite got to see on cards: the moment when Emrakul emerges from the space between worlds and rises out of the ocean. Maybe a little more of the lightning effect, since this is now a red spell. The addition of Nahiri very small in the foreground, her glowing sword upraised, facing away from us.